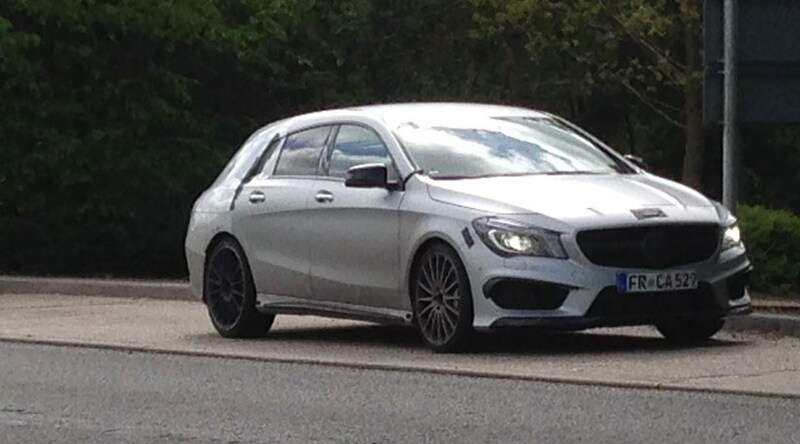 CAR reader Nick Burgess spied this Mercedes on his travels around Milton Keynes - not far from the company's UK headquarters. Nick was driving on the A421 to the west of Milton Keynes when he spotted this silver shooting brake on weekend manoeuvres. It looks to us like Daimler's new baby shooting brake - the fifth and final member of the burgeoning A-class family. The scant disguise on the Mercedes wagon confirms that the company's smallest estate is bound to take the swooping shooting brake style from the CLS. The emphasis is definitely on style over space, with a sloping roofline the antithesis of a load-lugger's box profile. And, to these eyes, it looks remarkably as though this car is sporting the AMG bodykit. The large rims and gaping front spoiler and air intakes suggest that Mercedes is preparing a go-faster version. 'I took these pictures on a Saturday in May,' Nick tells us. 'I was on the A421 just to the west of Milton Keynes near the Bottledump Roundabout.